… and let others do theirs. You can’t do it for them. And they won’t appreciate your efforts if you try. All relationships require work on both parts to make it a true partnership. But NOT everyone is conscious enough to own what their part of that work is. You can only do YOUR work. You cannot do the work for other people. If you try to, you will be enabling bad behavior in the relationship and it will make you an accomplice to their ignorance. It also forces you to make up the imbalance yourself which only creates resentment on your part. Where there is NO AWARENESS, there is NO GROWTH. If you try to do the work for them, you rob them of their own opportunity for growth. You cannot remedy that situation by continuing to try and do the work for them. Nothing will change and after awhile, you will grow extremely frustrated because you are not getting your needs met and they will become frustrated because they will not understand what their work is – because you have been doing it for them all along. You cannot get upset with a situation that you condoned from the start. Doing people’s work for them gets you nowhere. 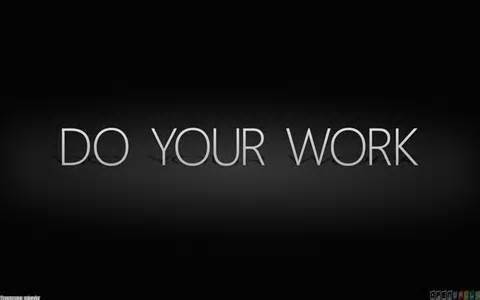 Do your work and let others do theirs. Nobody wins by your trying to do the work for both of you. If you do not do the work, and just step back… you will give your partner space to recognize that there is a need for that work to be done and then you can start the dialogue towards healing. What options do you have?